What Rights Are Hijabi Women Fighting For In Sierra Leone? 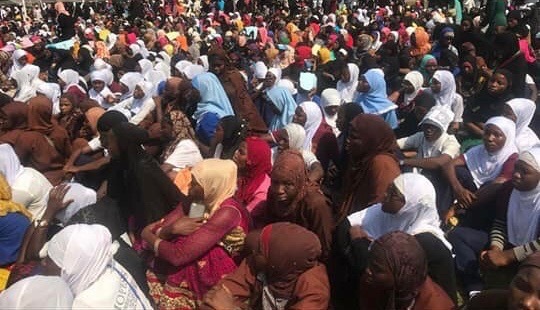 Friday February 1st 2019, hundreds of Muslim women took to the streets of Freetown to protest discrimination in the workplace and educational institutions. The march was organized by Sierra Leone Women’s network and supported by many Islamic organizations across the country. Many Sierra Leoneans at home and abroad were taken aback by the protest because as far they are concern, Sierra Leone is a religious tolerant country, with a Muslim majority, and having an issue of discrimination against Muslim women that wear the hijab is unheard of. Well, fellow Sierra Leoneans I hate to break it to you but this is a reality for thousands of Muslim woman that have chosen to wear the hijab. Lets go back in time! Hijabi, Hijabi, Niqab, Niqabi, are relatively new terms for many Sierra Leoneans, including Muslims. Twenty years ago, though Muslim women were aware of the religious concept of hijab and Niqab, and wore modest clothing and head covering, they did not necessarily saturate professional fields because since most were housewives. 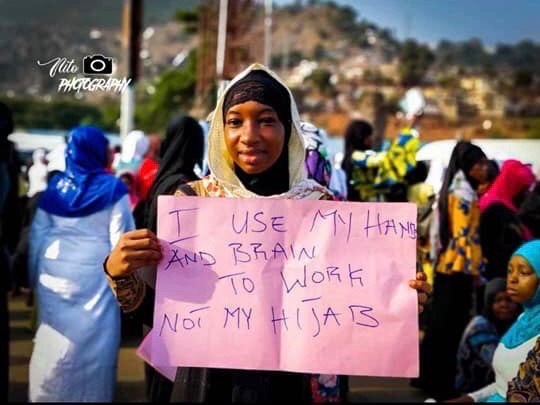 The rise of educated, professional Muslim women wearing the hijab in Sierra Leonean have suddenly led to the spotlight being shined on them. These are smart, ambitious, creative and professional women that want the same opportunities that men and non-Muslim women are awarded in the country. As they occupy these spaces, employers and school administrations started requiring them to remove their head coverings before they could be admitted to certain schools, take on professional roles and be members of certain organizations. Some of these requirements are due to uniformity. However, many hijabis have offered and are willing to wear the uniform with some minor modifications but they have been rejected. You also have to realize that as these issues of discrimination were going on, many were not reported. Many hijabis I spoke just have accepted it as the status quo. A few years ago a friend reached out to me with interest to wear the hijab but was concerned that she will not be able to work at her then current bank job. She stated she will have to stop working and she could not financially afford to stay home at the time. While I empathized with her and gave her encouraging words and prayers, I was not paying attention. Like many of you today, I could not comprehend why a company in Sierra Leone (religious tolerant Sierra Leone) would not accommodate our diversity. I have heard from several women lamenting on the same frustrations from different areas of the professional arena. These women are not making this stuff up. We have got to pay attention and listen to them! Below are some of the comments I have personally received. So, while in many cases it is a valid question to ask “What Rights Are Hijabi Women Fighting For In Sierra Leone?” please take the time to talk to a Muslim, a hijab wearing Muslim in Sierra Leone and ask them about their experiences before going in to a debate about “fundamentalist muslims” and trust me Sierra Leonean hijabis are everywhere and will answer your well meaning question. To Hijabis in Sierra Leone, I commend you for finally standing up and showing out to peacefully demand your rights as Sierra Leonean. I urge to continue the advocacy behind the scenes and in public offices. I encourage you to keep records of any and every evidence of discrimination and share it to the public. Save every email, every text, every letter or recording that you have to show the world how you are being treated in your country, a country known for religious tolerant. Speak up! Every time!